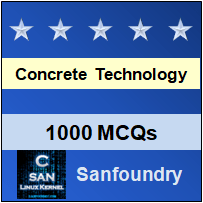 This set of Concrete Technology Multiple Choice Questions & Answers (MCQs) focuses on “Maturity Concept of Concrete”. 1. What is concrete maturity? Explanation: The maturity concept uses the principle that concrete strength is indirectly related to age and its temperature history. 2. Maturity methods provide a ___________ simple approach for strength of concrete. Explanation: Maturity method provide a relatively simple approach for reliably estimating the in-place early age compressive strength of concrete during construction. 3. The maturity method is a ___________ approach to predict the early age strength gain of concrete. Explanation: The maturity method is a convenient approach to predict the early age strength gain of concrete, using the principle that the concrete strength is directly related to the hydration temperature history of cementitious paste. 4. It is a __________ method. Explanation: It is a non-destructive testing method as contrasted to breaking cylinders in the laboratory. Explanation: It reduces the quantity and cost of sampling and testing by reducing the number of cylinders that need to be cast and broken to determine strength. 6. What does x3 in power’s experiment stands for? ]Explanation: Power found the relationship to be 240 x3, where the value of x is the gel/space. Explanation: A lower ratio leads to higher strength and durability, but may make the mix difficult to work with and form. 9. “Where the matrix is extremely dense, a weak aggregate may become the weak”. Is this statement true or false? 10. What is the compaction factor for medium degree of workability?